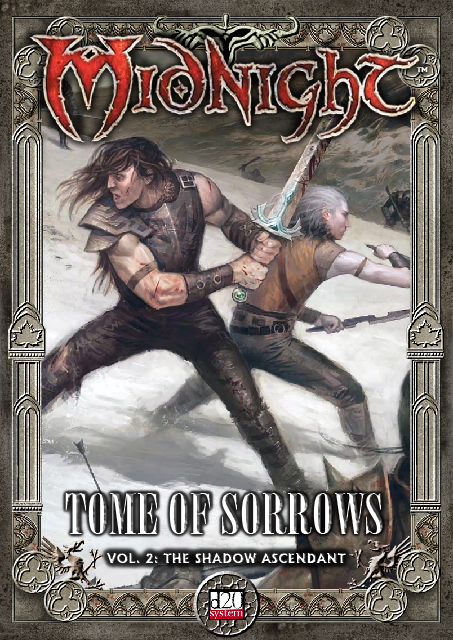 The second installment in the Tome of Sorrows series of netbooks for the award winning Midnight setting brings to you new tools and weapons to be used in the name of the Shadow in the North against the insurgence. Inside this book you will find new prestige and legendary classes, a new core class, the Kurasatch Udareen, or mother-wives of Izrador, as well as more than 15 new Villainous Paths, over 30 new creatures and more! Glad to see ToS2 made it out! Just skimming it, looks like a great piece of work. kudos to the other contributors too, i think we made a very worthwhile sourcebook there. "Et Semmel Emissum Volat Irevocabile Verbum"
Well, nagging me has actually been one of the things that kept me going all this time, and working on this thing was no easy task, as harrowed can say, he too took it and eventually couldn't keep going any more. I am happy with what we have, although i would like to improve certain parts of it I believe what is there is already good enough to be out. Done, it is now a .zip format. My god, how long has it been now? Two years you've been chugging away on this like a trooper? It's a walk down memory lane seeing this stuff. Outstanding work. Some very nasty stuff here. A great Xmas present. Actually 3 years have gone since this baby got to my hands, or close to that, when I compiled the threads on the old site I already was in charge, I think the hardest part was to take a small draft i made for the introduction and turn it to the one you can see there. It's a walk down memory lane seeing this stuff. I have to say it was a trip down memory lane for me as well, specially in this last revision of the content before releasing it. Remember when we did the new KU core class for the Tome, Dirigible? Man, 2nd edition was fresh in the market! So. What's the plan for ToS 3: The Resistance Strikes Back ? Even though I don't celebrate Christmas, I’ll gladly take this gift. Thanks for all involved in this. Thanks, merry christmas from France. My head is still full of hair, thankfully. But, er, ... where is the zip file? I can still only find the RAR file. No, this is BETTER than that! Youa re in the credits too, mind you, but since I did not get your name to put there, you are merely listed with your userhandle. Enjoy the holidays, and the Tome! Well, more often than not people having problems with usual windows standards are using macs. You on linux there? I'm using Windows XP, and RAR is not a "usual Windows standard". ZIP is (and has been for many, many years). Although WinZip (the most common program) is shareware, there are numerous freeware implementations as well, and Windows XP will open ZIP archives without any additional software in any case. RAR is (so far as I know) only available through shareware, as I mentioned previously. Since ZIP serves my needs perfectly well, I have no desire to spend money on alternative compression software. Very nice work on the Tome of Sorrows 2 guys. It looks very professional. Keep up the good work. I've been using WinRAR for a very long time now. Does both rar and zip files.